What most people fail to understand is that when chemicals enter the body, they don’t remain isolated. You may get chemicals entering the body from different sources at different times. But as they work their way around the body some may combine with other chemicals which can have devastating effects, as the experiments below shows. What kind of impact can this have on a newborn child? By itself mercury has a devastating effect on the brain. Information was taken from the following link. Toxics can make each other more toxic. “A small dose of mercury that kills 1 in 100 rats and a dose of aluminum that will kill 1 in 100 rats, when combined have a striking effect: all the rats die. “We therefore decided to test the effects of both female and male hormones on the neurotoxicity of thimerosal. For example, 50 nanomolar thimerosal causes less than 5% neuron death within the first three hours incubation and 1 micromolar testosterone causes no significant death within this time frame. However, mix these two together and 100% neuron death was observed at the earliest time point checked. This represents a severe enhancement of thimerosal toxicity (see Figure 6). Further, at 12 hours the neuron death effected by 50 nanomolar thimerosal alone could be reversed by 1 micromolar estrogen. Make a dose of mercury that will kill 1 out of 100 rats. Then make a dose of lead that will kill 1 out of 1000 rats. Combine the doses and 100% of exposed rats will die. People are continuously exposed to a wide variety of chemical substances, biological agents, physical agents, and other stressors. • Consequences that are significantly different than would be expected from individual exposures. • A range of combined acute and chronic effects. • Effects that can appear immediately or sometime later. • Increased or unexpected harmful effects — including entirely new kinds of effects. The possible combinations of exposure are huge and knowledge is limited about the effects of mixed exposures. Individual susceptibility adds to the complexity of exposure and resulting outcomes. New approaches are needed to figure it out. A common misconception is that “inactive ingredients will not interact”. A manufacturer may claim a product has been tested and proven to be 100% safe when used as directed. That might be true — there is no requirement to test for synergies. • Exposure to noise and the solvent toluene results in a higher risk of hearing loss than exposure to either stressor alone. • Common food colors are synergistically neurotoxic with flavor enhancers at levels gotten from a typical snack and drink. • Exposure to carbon monoxide and methylene chloride produces elevated levels of carboxyhemoglobin that reduce the blood’s ability to carry oxygen. • Aluminum, copper, lead , mercury, and cadmium can be found in mussels at levels that, individually, are considered below the threshold of toxic harm. But these metals act synergistically with low concentrations of the mussel’s own okadaic acid to kill cells. • Viruses can increase susceptibility to heavy metals. And vice versa. • In this study viral infection increased the uptake of PBDE. 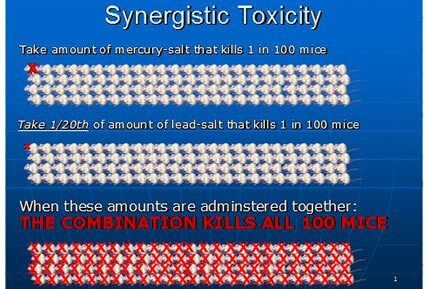 • PBDEs, PCBs, and methylmercury are each synergistically toxic with the others. Very low exposures combine to induce greater than expected harm. • In general, metals have synergistic toxicity — and organic metals have synergistic toxicity with organic compounds. Research indicates that low PCB exposure while in the womb, in combination with low exposure to methylmercury and lead, results in cognitive impairment. • Exposure to a combination of 1 PCB, 2 dioxins, and 3 pesticides means a person is 38x more likely to develop type-II diabetes than someone exposed to just 1 of the chemicals. • Lupus clusters — the localized outbreaks of lupus at rates much higher than in the general population — are associated with sites generating multiple chemical exposure. In this example the rate of lupus was 30x to 99x higher for people living in a 6-block area built atop a retired oil field waste pit. Key contaminants were determined to be mercury, pristane, and phytane. • Tungsten and cobalt together can be carcinogenic and together have been found to rapidly accelerate the growth of human leukemia cells. • Titanium dioxide nanoparticles are being used in an expanding range of products. These nanoparticles have ben observed to greatly enhance the accumulation of cadmium in fish. • Melamine and cyanuric acid are both considered non-toxic at low doses. But if those low doses combine in the kidneys, a fatal amount of crystals can form. Melamine and cyanuric acid were added to wheat gluten used as an ingredient in animal chows that caused the death of hundreds of pets in early 2007. Similar meals have been fed to farmed chickens, pigs, and fish. In September 2008 melamine was identified in at least 22 brands of Asian baby formula after an unusually high incidence of kidney stones were reported in infants, including several deaths. In November 2008 melamine and/or cyanuric acid were identified in several major brands of U.S. baby formula (Abbot Labs = Similac, Mead Johnson = Enfamil, Nestle = Good Start). Initially the FDA stated that any amount of exposure to melamine is unsafe for infants, but later asserted that 1 ppm melamine or 1 ppm cyanuric acid is safe as long as both chemicals are not present at the same time. Whether these levels are truly safe enough for infants remains unknown. • Rats who drank milk retained 2x more mercury in their bodies than rats who didn’t. • The dust shed by automotive tires contains a mixture of chemicals. These chemicals act in synergy with each other. • Microscopic particles in diesel exhaust combine with lipids in cholesterol to activate genes that trigger inflammation of blood vessels, in turn leading to atherosclerosis, heart attacks and strokes. • Thallium is synergistically toxic with sodium hydrogen phosphate (Na2HPO4), a buffering agent commonly used in vaccines. • Gardasil recipients who reported an adverse reaction to the Vaccine Adverse Events Reporting System (VAERS) were 3.3x more likely to report a neuromuscular and coordination problem if they were injected with Menactra at the same time. Slide 25 from this presentation by Dr. Boyd Haley illustrates the synergistic toxicity of three ingredients commonly found in vaccines — thimerosal, aluminum hydroxide (AlOH3), and neomycin. • By themselves, neomycin and AlOH3 are less cytotoxic than thimerosal. • 24 hours after a 50nM (50 ppb) exposure to thimerosal, less than 40% of cells survived. • 12 hours after a combination of thimerosal and neomycin, roughly the same number of cells died. • 6 hours after combining thimerosal, neomycin, and aluminum hydroxide, the same number of cells died — and by 24 hours all cells were dead. 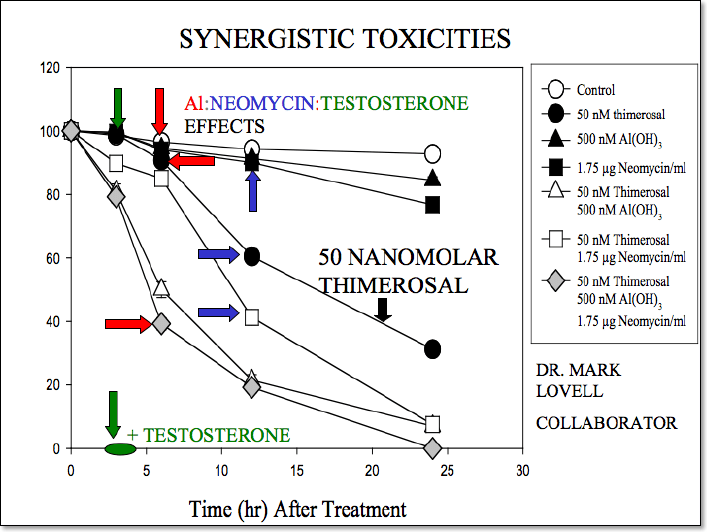 • Adding testosterone to the other three made the toxic effect total and immediate — all cells were dead within 3 hours. This article demonstrates that a person’s unique metabolism can also influence toxic exposure. The mother of a newborn was prescribed acetaminophen with codeine for lingering episiotomy pain. This is a fairly standard practice. Initially the baby was healthy. Then he developed increasing lethargy and after 11 days was brought to a pediatrician due to concerns about his skin color and poor feeding. Two days later the boy died. It was determined the boy had 6x more morphine in his blood than is considered safe for a neonate. He also had high levels of acetaminophen (which depletes glutathione, and important detoxification molecule). It turns out the mother has three CYP 2D6 genes. These genes express the enzyme for catalyzing the O-demethylation of codeine to morphine. In other words, the mother is an “ultra-rapid metabolizer” of codeine to morphine — leading to an unexpectedly fast build-up of the opiate in her breast milk. Ultra-rapid metabolization of codeine occurs in as much as 30% of some African and Asian populations. It’s not really known how often infant death may occur from this scenario. At any rate, a number of infants that exhibit depressed breathing, lethargy or poor feeding will have the symptoms ascribed to some other condition. Mothers generally are not pre-screened for CYP 2D6 gene profiles and morphine toxicity is generally not investigated when babies are taken for an exam. The order of toxic exposure can make a difference. This study examined what happens when shrimp are first exposed to carbaryl and then a few days later to chlorpyrifos. It also checked what happens when exposure is the other way around. Both insecticides act on the nervous system by targeting the enzyme acetylcholinesterase (AChE). The excitotoxic cascade causes death. Carbaryl was almost twice as deadly if the shrimp were exposed to chlorpyrifos first. Drugs are given to livestock. Portions of the drugs, and their metabolites, are excreted in manure that is used as fertilizer on lawns, gardens and farms. When it rains the chemicals are washed into waterways where some eventually flow into drinking water systems. These chemicals join a cocktail of other compounds leftover from when people flush, rinse, and pour out chemicals from 1000’s of sources. Add in the chemicals from wind-borne sources and underground contamination. The result is something no water treatment facility is equipped to handle. The synergistic combinations are boggling. The long-term impact of drinking these ‘trace’ level combinations is unknown. ‘Unknown” is not equivalent to “seems to be safe”. The mixture affected cell physiology and morphology to decrease human cell proliferation by 30%. The old-fashioned saying that “the dose makes the poison” must now be updated to reflect other factors that determine toxicity — timing, combinations, and each individual’s unique metabolism. One-size-fits-all approaches are not sufficient.